A unique, worldwide patented bio-product consisting of bacteria cultured on barley straw, enzymes and activated barley straw. Easy-to-use, no mess, no measuring. 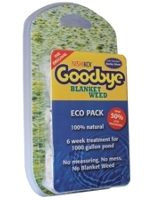 Simply drop one water-soluble sachet of 'Nishikoi® Goodbye Blanket Weed' into the pond or filter every week. One water-soluble sachet treats ponds up to 1000 gallons.